Solving these problems led us to an architecture that is based on interceptors, the context map, and an adaptor to the HTTP connector. In their original form, interceptors were a way to reify the callstack of request processing. That is to say, what would normally be a layered jawbreaker of function closures became a sequence of data structures. This model has allowed us to extract an increasing amount of logic from the core framework into interceptors. For example, routing is usually implemented as a core function of a web framework. Because an interceptor can enqueue more interceptors to execute, Pedestal implements routing as an ordinary interceptor. Application logic is also implemented in interceptors. Interceptors are called in core.async go blocks, so one interceptor may be called on a different thread than the next. All bindings will be conveyed to each interceptor. An interceptor may return a channel instead of the context map. In that case, the channel is treated like a promise to deliver the context map in the future. Once the channel delivers the context map, the chain executor closes the channel. The pedestal-service library includes a large set of interceptors that are specialized for HTTP request handling. Interceptors expect certain keys to be present in the context map. These context bindings are part of the contract between provider and interceptors. Along with moving core logic into interceptors, we have moved the HTTP connection handling out of interceptor processing to create an interface for the chain provider. 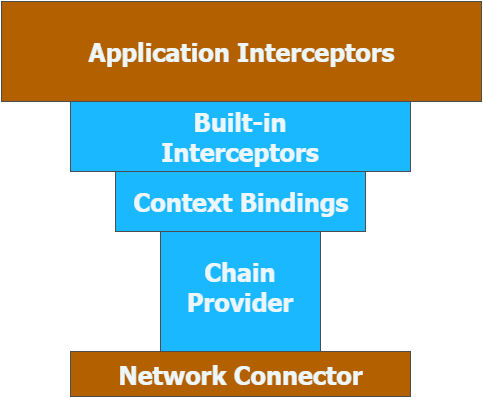 The chain provider sets up the initial context and queue of interceptors. It starts execution. Pedestal includes a servlet chain provider out of the box. It connects any servlet container to an interceptor chain. The create-servlet function orchestrates this work. This is strictly a convenience function that takes a service map of everything needed to run an HTTP service. It is possible to create other chain providers. The fast-pedestal sample shows how to do this with Jetty. The servlet chain provider immediately works with every HTTP server that works with servlets. This allows many deployment scenarios. Sometimes it is advantageous to work directly with a server by implementing a custom chain provider.